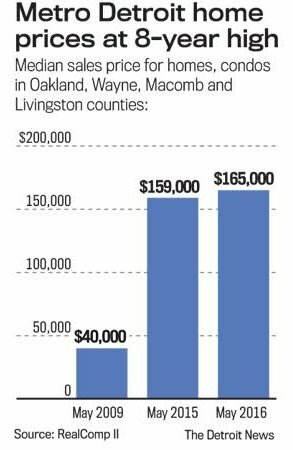 Metro Detroit’s housing market has skyrocketed in value since the depths of the housing crisis. Detroit investment properties capital appreciation figures are impressive and show no signs of slowing down. No other market in the US offers the same “bang for your buck.” Your investment dollar goes further in Detroit, with price points significantly lower than other popular investment markets like Memphis, Atlanta, Indianapolis, or Cleveland. Detroit and its surrounding suburbs offer the perfect balance between capital gains potential and high net cash returns. Investors from around the world have invested tens of millions of dollars into Detroit’s neighborhoods over the past 7 years. This helped drive the housing market forward while lending restrictions pushed many home buyers out of the market. Gradually, as the national housing market continued its upward swing, more home buyers re-entered the market and helped home values surge. No market felt this surge more than Metro Detroit, where prices are up almost 70% from its lowest point in 2010. The good news is that investors haven’t missed the boat. The housing market is expected to continue its climb, and working with US Investor Group's Detroit real estate investments team will ensure you get access to exclusive deals which are significantly under market value. Since the economic downturn of the late 2000’s, Metro Detroit has experienced a total resurgence of its economy, fueled by traditional industry as well as new businesses. Metro Detroit’s economy will forever be linked to the Automotive industry, home to America’s three largest automakers: General Motors, Ford, and Chrysler. During the height of the global financial crisis, Detroit’s “Big 3” automakers were on the brink of collapse, culminating in a bailout by the US government. General Motors, the largest automaker in the world filed for bankruptcy and received federal dollars during its restructuring. Since then, the company has far exceeded the expectations of market experts, becoming one of the most profitable companies in the world. Since its low point in 2009, the company has earned over $30 billion, punctuated by a record $9.7B profit in 2015. Ford Motor Company, the country’s second largest automaker and one of the largest employers in Metro Detroit has also performed well, earning over $8.5 billion in 2015 alone. In January 2017 Ford announced it would be scrapping plans to build a billion dollar plant in Mexico, choosing instead to reinvest in its Michigan plants and keeping jobs in Metro Detroit. By shifting their focus to new product development and innovation, GM, Ford, and Chrysler have all made positive gains which will have a reverberating effect throughout the region. While Detroit will always be linked with the manufacturing sector, the City’s economy is diversifying into other industries. 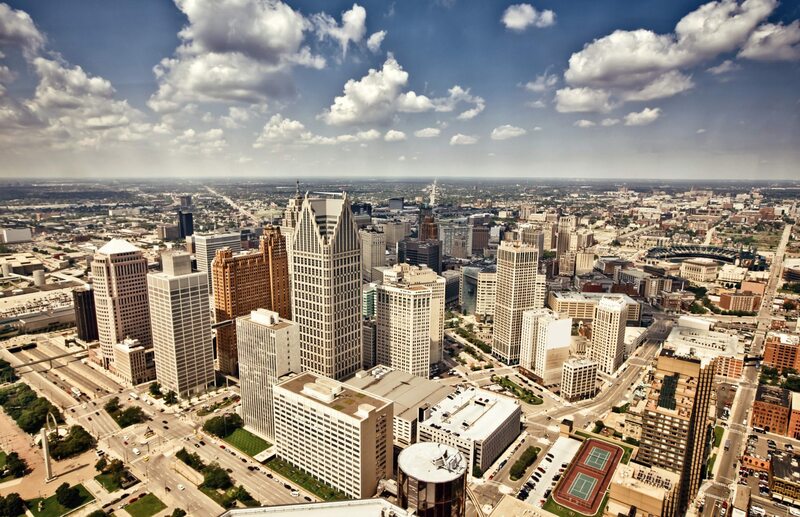 The healthcare industry employs tens of thousands of Detroiters and is home to some of the largest companies in the field. Blue Cross Blue Shield of Michigan, Henry Ford Health System, and Detroit Medical Center are all based in Detroit. With news of GM closing the historic Detroit-Hamtramck assembly plant, many are wondering how this will effect the city’s resurgence. According to the Associated Press, news of the plant closing will have a minimal effect on the city’s overall economy. Experts believe Detroit’s economy is shifting away from manufacturing in favor of the medical and technology industries. Layoffs like the one announced by General Motors will have much less of an effect than previous layoffs because much of the money saved by the auto giant will be reinvested into technology (autonomous vehicles, electric powered cars). In the wake of Detroit's bankruptcy 5 years ago, JP Morgan CEO Jamie Dimon took a big gamble on Detroit. The head of the nation's largest bank decided to invest more than $100Mil in the city which was ravaged by the global financial crisis as well as years of mismanagement at the city and state level. Fast forward to 2018, where the investment was so successful Chase has decided to invest another $500Mil as part of its AdvancingCities Initiative. In the cash strapped city, the city government was limited as far providing the resources and incentives to spur investment. Thankfully, the private sector stepped up in a major way. Since the depths of the mortgage crisis, the city has witnessed staggering investments in its commercial center as well as its neighborhoods.